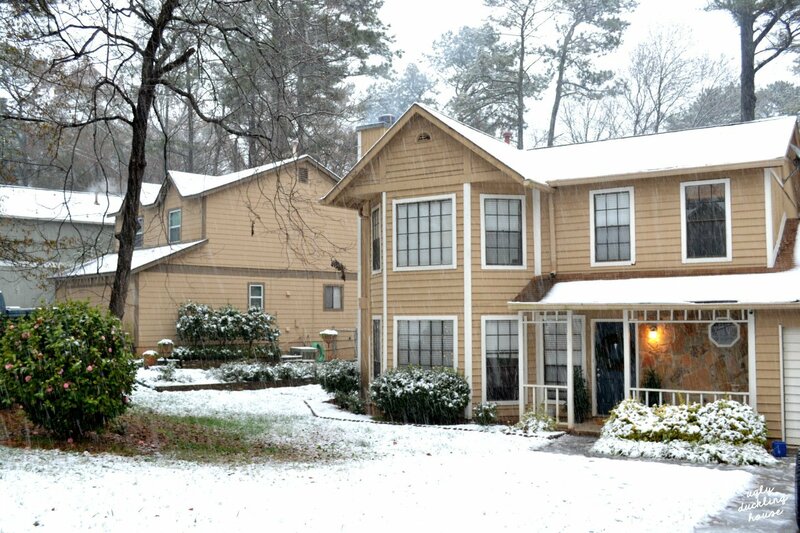 This year’s Christmas theme decor is all about woodland winter relaxation. 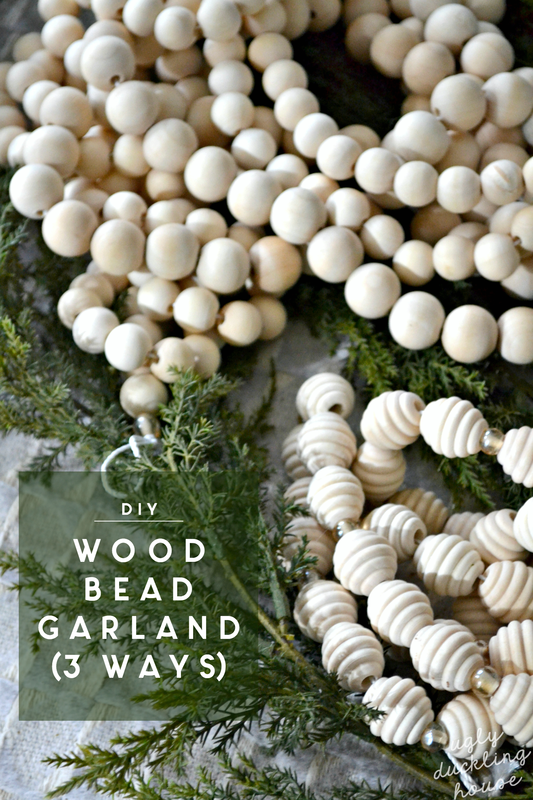 With lots of natural wood tones and neutrals of gold, silver, and white, I have tons of DIY ideas in store, starting with this DIY wood bead garland (cheaper to make than to buy!). I couldn’t find a tutorial for really long strands, so I made one myself! When I showed a few sneak peeks of my Christmas decor on my Instagram stories (and also asked for advice on what was missing from the tree, so thank you to those of you who weighed in! 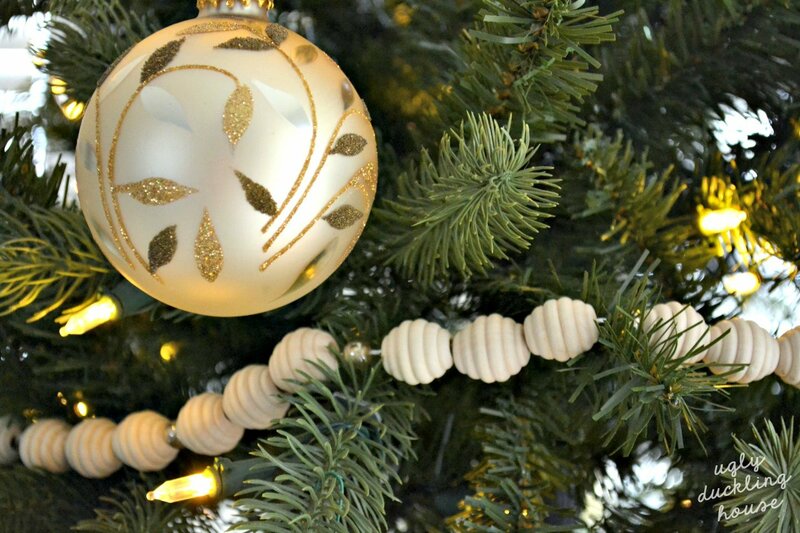 ), a few of you commented on the wood bead garland that I incorporated into the tree. I wasn’t exactly planning on having a tutorial about it, but since several asked about where I got it, I figured I’d provide you sources with details on how I made it, and show it off a little more! Charlie and Stella weren’t really sure what to do with themselves. Charlie, I guess you could say, was curious at best, and did a little exploring before it really started to come down (she remained inside the rest of the afternoon). 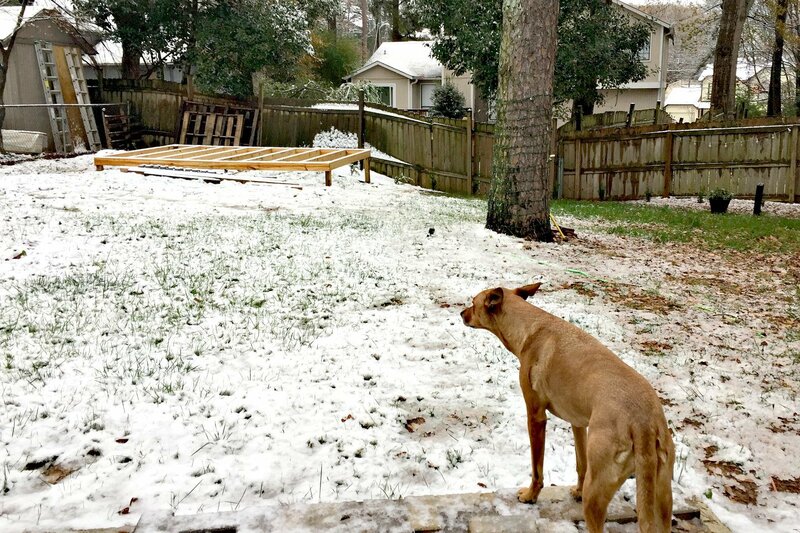 Stella prefers the warmth of the house and refused to go anywhere near the white flaky stuff. I suppose I can’t blame her… if I were short enough that my belly fur might touch it, I would reconsider the urgency of nature’s call, too. Since I was feeling a lot like Stella and preferred a cozy fire, I took several hours to decorate the house for Christmas. This coming Saturday will be my first time hosting the family over for a Christmas dinner, so the pressure is on to make my home look as festive as possible (and possibly distract from all the unfinished projects). I’m both nervous and excited, so I’m pulling out all the glitter! I got a few great deals recently from some 60- and 70%-off Christmas sales (Joann’s had a great one! ), so I did a little editing of the items I bought to fit with the neutral decor scheme I’m going for. 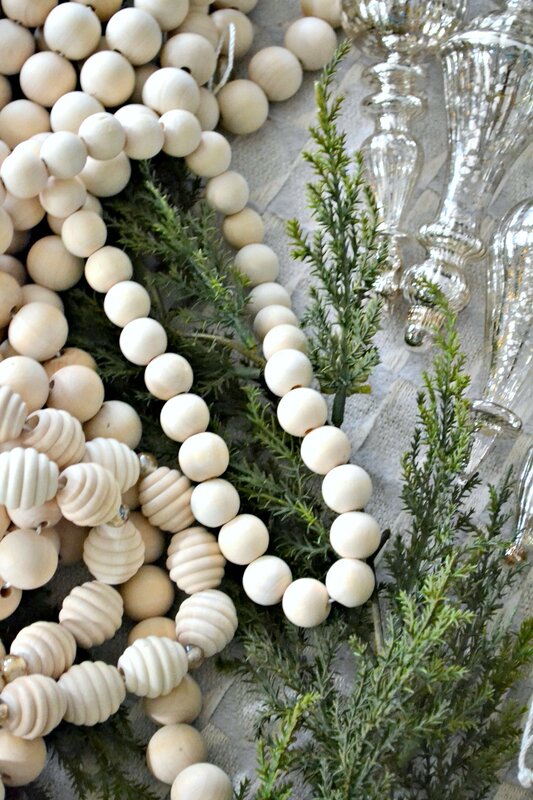 I noticed very quickly that wood bead garland is rather expensive to purchase outright. 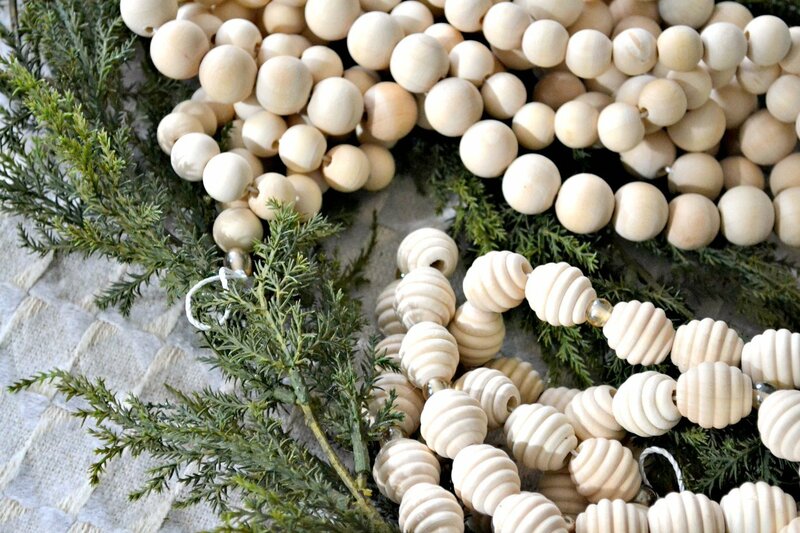 It’s not so much that the garland itself is expensive — often listed less than $20 per strand — it’s that you need a lot of those strands to fully fill in a tree. It’s kind of like seeing a calorie count “per serving” on a candy bar, and then you find out the serving size is half a candy bar. Who the hell eats only half??? When it comes to garland, serving size is like a fourth or even a sixth, depending on the length available. just a few feet per strand — which gets me only about 1/2 – 2/3 around the bottom of my tree in a single rotation with proper slack to drape on the tree — that’s a lot of strands to cover the tree! I was going to need to buy several, fully-filled-in, large beaded strands. Didn’t think I had to be that specific to find some, but I was wrong! That was going to get costly, quick. 2. Therefore, it’s cheaper to make yourself. I divided each batch I bought into halves and strung each one for a total of six strands: 2 medium round, 2 large round, and 2 threaded strands. 3. 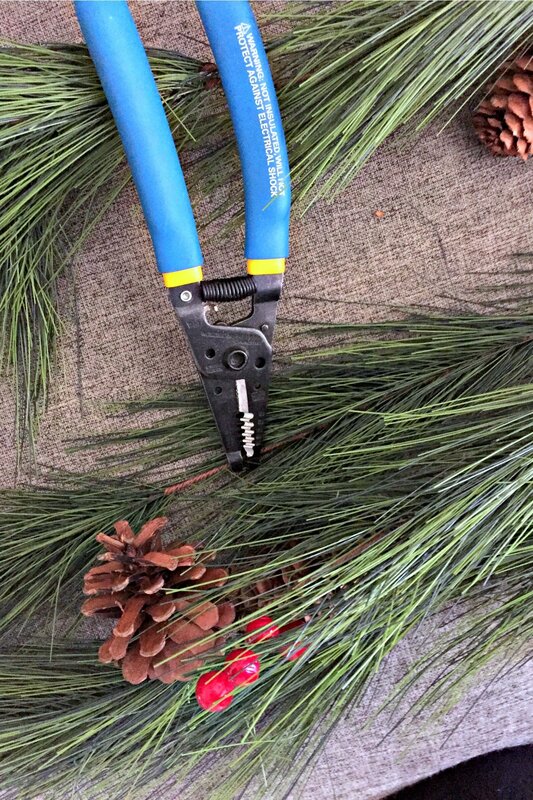 Twist/glue or tape the end to prevent fraying while stringing. I used a white twine-like thread, which unravels pretty easily. Cheap gift wrap tape on the end and clipped to a point served as a sufficient needle (and didn’t need to be threaded on an actual needle). I tried gluing the end instead, which worked okay for the larger beads, but still unraveled with the smaller threads because it kept catching on the inside of the unsanded wood. 4. For a more professional look, tie the ends in a loop with a glass bead. With the carved beads, I threaded a wood bead and glass bead in a pattern; for the other two kinds, I threaded just the wood beads and finished on both ends with a glass bead. The loop on each end also served a purpose since it could be used to drape the end onto the tree. You can also make tassels for the ends if you prefer or aren’t planning on needing the loops to hang — there’s a great tutorial for that here. 5. Cover ends on the tree with ornaments. Since I mixed and matched the wood beads, I wanted to also disguise the end of where one strand ended and the other began. 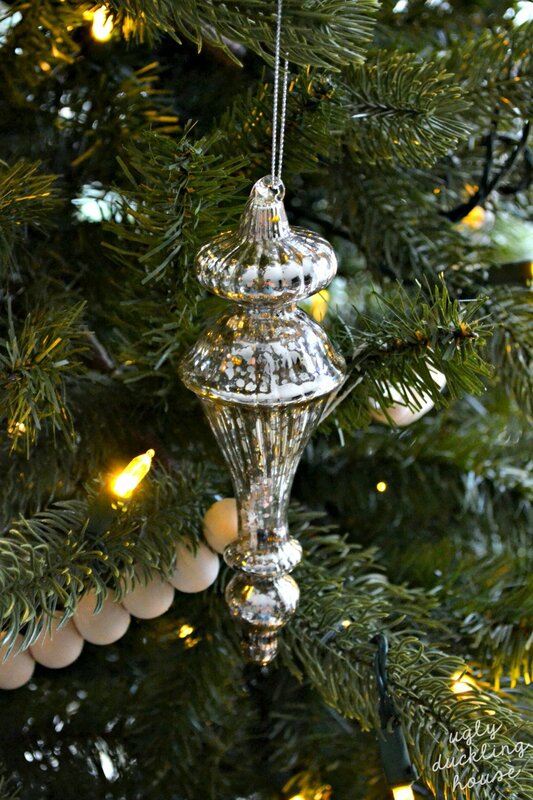 Strategically-placed ornaments did just the trick! There you have it: a somewhat short but simple tutorial, and with a little cost savings. I did the math, and this cost me around $50 for all of the strands. The same would have cost me around three times as much for the same quality, and the variety will let me drape them anywhere! 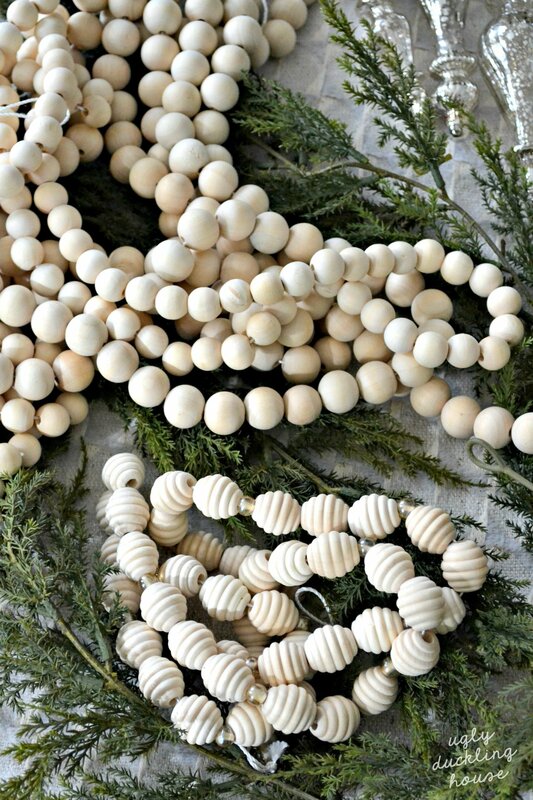 The only other inexpensive version I found online that I liked that was comparable were these, but they have a majority of white painted beads instead, and I would argue you’d need at least 3 (online reviews say “I wish I would’ve ordered a second”, but that would still probably look pretty dinky with how many my tree took). I’ll be sharing more on each room (living room, kitchen, and dining room) as its finished this week! Oh! and don’t forget, there’s still a little time left to enter the wine rack giveaway! If you missed that, go back and check it out. What is your Christmas “theme” this year? If you have one, did you make any handmade items for it? I’ll have another idea next that ties in too! Recently discovered your blog and I’m so glad I did because you are giving me hope that one day I’ll be able to do fun, crafty stuff like this for Christmas! My house is too much of a disaster zone right now to even think about putting up Christmas decorations. Awesome cost savings on these too, btw!! LOVE THIS! 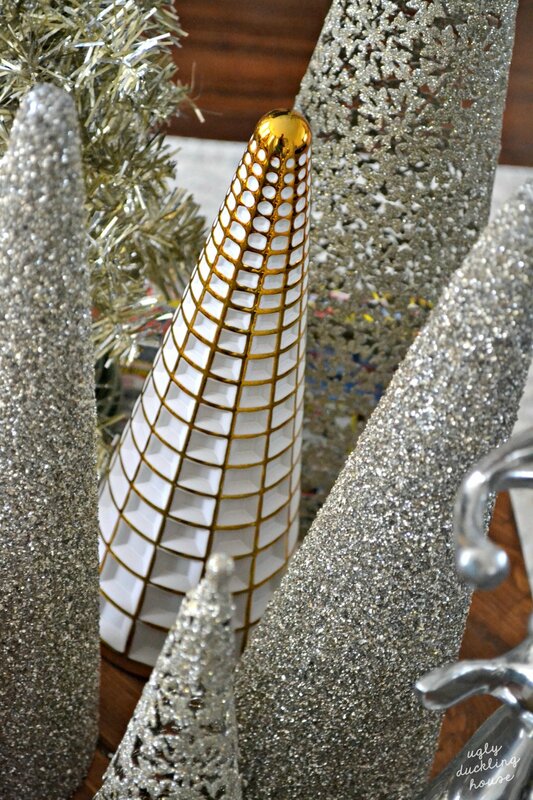 I’ve been on a hunt for versatile, multiple season decor and I don’t remember where I saw the strands of beads first but I’ve been trying to find tutorials to make one for my tree this year but also use on the fireplace mantel, etc. and all the tutorials I’ve found were for SHORT ONES. 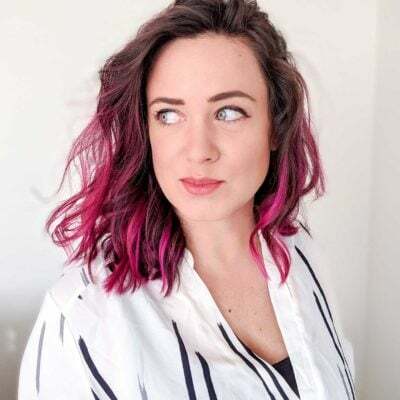 Until I found your blog…. THANK YOU SO MUCH FOR SHARING!!!!! You saved my day!!! Now to make my own strands to use for fall, Christmas, AND winter… probably even Spring… thank you again!!! So glad you found it helpful! And good to know about long vs short! Thank you so much for sharing! How tall is your tree? 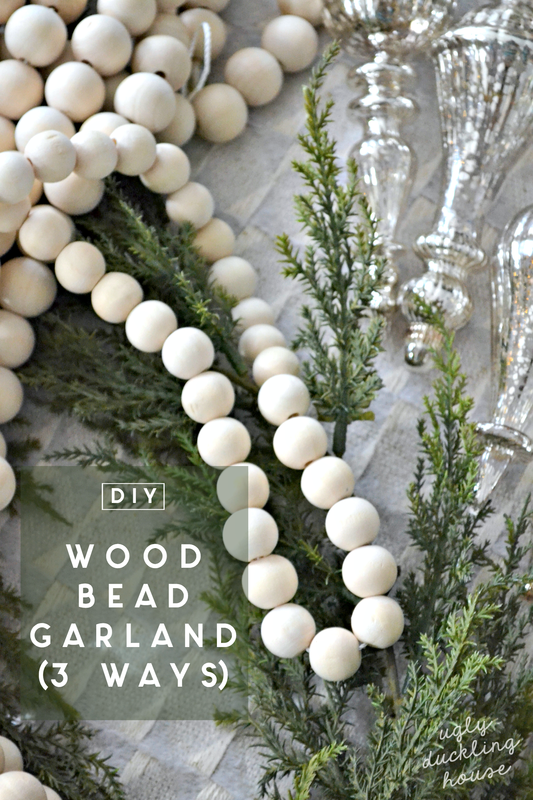 I read you need 9 feet of garland per feet of tree which would mean you need a lot of beads. My tree is 7.5 feet, I believe. I probably made about half that length based on that estimate. I also tend to cheat the window side since it’s not really seen.